A bilingual ceremony! That’s the most exciting kind of ceremony because your love in celebrated with the traditions and languages of two cultures. You are sure to have an amazing wedding if it’s bilingual/bicultural! Consider including a Lazo and Arras if you are including your Spanish speaking or Filipino heritage. Don’t forget the wedding crowns and an “Opa” for a Greek ceremony. Or plan on a beautiful chuppah for even the most Jewish-lite ceremony. 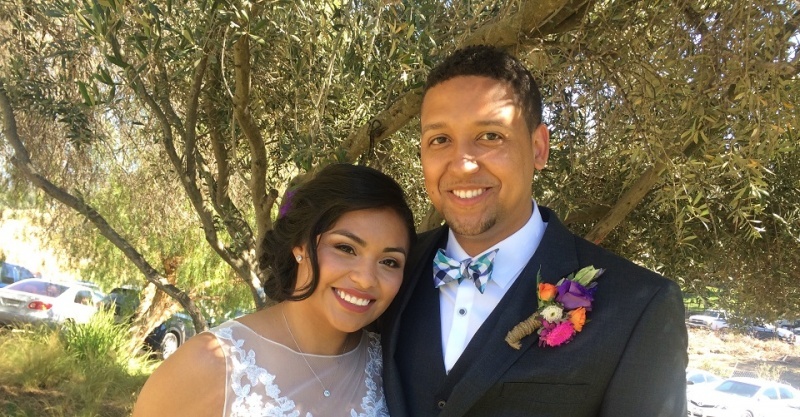 If one of your families is from China, Iran, Afghanistan, Vietnam, India, Scotland or even living on the Rez, you will really enjoy creating an amazing bilingual/bicultural marriage ceremony with Janet Westall as your officiant. Your marriage will be a celebration of language, tradition and love. When the time comes and you’re looking for a wedding officiant, contact Janet Westall of CEREMONIES. She is the owner and founder of CEREMONIES, but she’s much more than that. 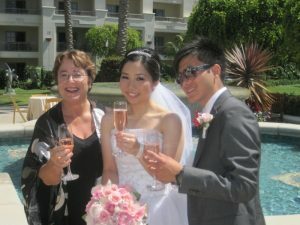 She has more than 25 years of experience officiating a wide range of different weddings throughout Southern California. Janet Westall is well known for her delight in celebrating bilingual/bicultural weddings. She will help you to celebrate a marriage ceremony that feels as it should – warm, inviting, romantic and emotional. She will also help you put your own unique twist on your ceremony, so you can rest assured your marriage ceremony is truly unique, a true reflection of your cultures and also completely radiant with your love. 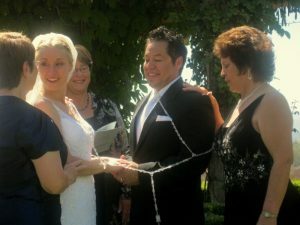 Choosing the right wedding officiant will ensure that your wedding dreams do come true. The day is all about love, from the exchanging of vows to the last signature on your wedding license. Selecting the right officiant for your big day is important. After all, they represent the interests of you and your soon-to-be spouse and will guide you through your ceremony from start to finish. Janet Westall is also a bilingual (Spanish/English) wedding officiant, and is happy to be there to guide you through your special marriage ceremony. Knowing not one, but two languages, she is able to include everyone at the ceremony and make sure that it’s a welcoming and respectful day for all. Call Janet Westall in Temecula today to enjoy talking about your bilingual wedding anywhere in Southern California. You’ll discover she’s THE perfect person to be your officiant. Call her today at 909-730-7342.